“The LEGO® Movie 2: The Second Part,” in theaters nationwide February 8, reunites the heroes of “The LEGO Movie” in an all new action-packed adventure to save their beloved city. Starting January 29, for a limited time, fans of all ages can experience the fun, action and laughs early by immersing themselves in a unique interactive world at The LEGO Space Hollywood, at the corner of Vine Street and Hollywood Boulevard in Hollywood, California. The 6,000-square-foot, fully enclosed, one-of-a-kind space will feature 40 minutes’ worth of interactive adventures, surprises and photo ops inspired by scenes and characters from the new film. Visitors can actually make themselves at home inside Emmet’s brick-built house; explore the surrounding terrain of the newly named Apocalypseburg, formerly known as Bricksburg; and discover far-away planets in the story’s strange and surprising Systar System. Join Emmet, Lucy (aka Wyldstyle) and their friends as they battle the mysterious new character General Mayhem and look though Lucy’s special binoculars for a glimpse of what’s in store on the big screen. Everything is awesome inside The LEGO Space Hollywood, where guests can also dance on spinning turntables, build their own LEGO creations, pose alongside their favorite characters like Unikitty and LEGO Batman, and step inside a giant DUPLO®heart confetti booth for extra-fun action photos. Admission is free. The LEGO Space Hollywood will be open from January 29, 2019 through February 10, 2019 at the hours listed below. It is located in the heart of Hollywood, where previous fan attractions for “IT” and “Ready Player One” have been staged to enthusiastic response. Weekdays (Mon-Thurs): 2:00 p.m. to 8:00 p.m. Weekends (Fri-Sun): 11:00 a.m. to 9:00 p.m.
See you in the Systar System. The much-anticipated sequel to the critically acclaimed, global box office phenomenon that started it all, “The LEGO® Movie 2: The Second Part” reunites the heroes of Bricksburg in an all new action-packed adventure to save their beloved city. It’s been five years since everything was awesome and the citizens are now facing a huge new threat: LEGO DUPLO® invaders from outer space, wrecking everything faster than it can be rebuilt. 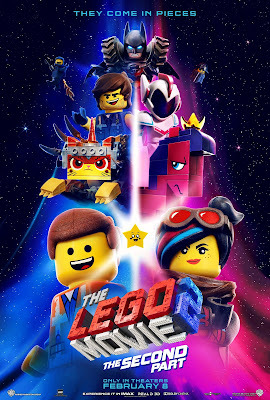 The battle to defeat the invaders and restore harmony to the LEGO universe will take Emmet, Lucy, Batman and their friends to faraway, unexplored worlds, including a strange galaxy where everything is musical. It will test their courage, creativity and Master Building skills, and reveal just how special they really are.